Four of these attic features were to surmount the south wall, to be aligned with the blind Vitruvian doors at either end of the colonnades. They were not included in the final design. 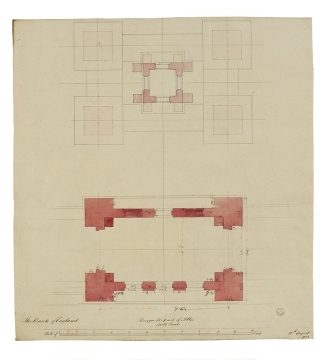 Construction on the walls began in August 1823, the date of these drawings, making it clear that construction was well under way with the attic design still not determined. The attic feature would have contributed a vertical emphasis to the Bank's skyline. It is essentially a pasticcio of Soanean elements elongated for a desired verticality. 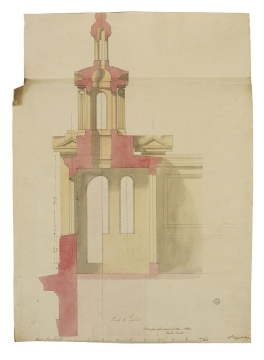 The lowest stage has a shouldered rectangular plan with fluted piers at each corner below incised, inverted and squared Ionic capitals; the block-like top girdled by four pediments. 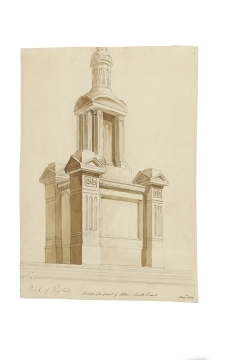 The middle stage has as its source the pendentive dome on four piers of the Soane monument (see SM 63/7/32 and 33, drawings 22 and 23 in the Soane Monument catalogue). The strigilated, cylindrical upper stage, perhaps resembling a lidded cinerary urn, appears to have had its finial trimmed in both sheets.